Note: Early in my blogging, I wrote imaginary tales using my toons to greater illustrate issues or techniques. Not only does it give me some writing practice, it’s hopefully less boring to read than a stodgy, dry post about how the game is played from the real-life mechanics we see as the player. So, indulge me while I introduce a new build of mine, Cassietetica, who has trained a few levels of Monk but has a calling to the rogueish arts. Cassie is my first serious attempt at multiclassing using 2 or more Monk levels. Either she will end up 18 Rogue/3 Monk (I moved to three Monk levels to gain negative energy attacks/debuffs using Fists of Darkness) or the more likely move to 14/6, where Cassie trains to Ninja Spy I for its invisibility, stealth, and shortsword prowess benefits. In any case, trapfinding and lockpicking will be Cassie’s speciality. Sounds of smashing chairs, loud music and conversations assailed my ears just on cracking open the door to the Wayward Lobster tavern. Adventurers and city-folk from all walks of life sat or stood about in conversation. A few people looked at me for a moment. I had the feeling I was being assessed to see if I could be helpful in some way. A halfling girl looked up from her tankard but didn’t drop her gaze at me. With a barely perceptible movement, she motioned me over to sit. I recalled my notes from the abbotess Syncletica: the halfling matched the description that the sensei gave me. “You one of Syncletica’s?” the halfling asked, not taking her eyes off me as she took a draw from her tankard. “Cassie’s my birth name. My new name just illustrates my allegiance to my vocation,” I said, taking a seat at the table and regretting it immediately. Apparently I sat in a small puddle of something that began to soak through the bottom of my robe. The rogue motioned at the barkeeps for another round. She pointed at me to ask if I cared for a half-pint. I raised my hand, shaking my head. The rogue stretched her small figure across to the adjoining table on my left to steal a bowl of nuts to chew on. “But you. I can see something’s different about you. In fact…” The rogue squinted at me, reached over to my right arm and tapped my sleeve, slowly and emphatically with her index finger. “You want to go rogue,” Allysen said, her voice muffled a bit by a mouthful of peanuts. Bits of peanut stung my face as Allysen coughed. “You take that back!” she yelled. Her right hand left the table surreptitiously while her left rose to point an angry finger at me. “It’s our way. You shouldn’t be surprised. Boy, you got a long way to go before you’re going to be a good rogue,” she said, pouring the platinum coins into her hand, eyes darting about in a silent count before returning them to the bag, her head bobbing a couple of times in satisfaction. “If I can find and retrieve more gear in an adventure without great expenditures to repair items or my injuries in that adventure, it would help a lot. Of course, that would include accessing locked doors and the chests behind them. At first I reached for the box but stopped myself. One of Allysen’s eyebrows rose as well as a corner of her mouth. I pulled a lock pick from my sleeve and a pair of goggles to examine the box. Something about one top corner didn’t look right. I plunged the pick’s tip into a small hole and heard a snapping sound. I examined the rest of the box and noticed an almost imperceptible crease on the left side. Carefully holding one side, I scooted a finger over the crease and pushed. I heard a snap–but was thankful it wasn’t the sound of my finger getting crunched. I picked up the box. On its underside was a tiny keyhole. I took out my lock pick set and carefully worked. After a few moments, the box clicked. I twisted the box and out dropped a small copper coin. We sat in silence for a bit before Allysen said, “I’ll admit something. I’ve been at this trapper thing for a while now. Lately it’s been quite a grind, very challenging. I can sneak into places just fine, usually find the nastier traps and pay the bills for my party. But when a fight shows up nowadays…” she stopped talking, shaking her head. My monastic training, limited as it was, could detect a pale aura about Allysen. A trace of it stays around everyone that’s been killed but resurrected before their soul becomes too long detached from their body. The more deaths you experience, the brighter or more substantial that aura becomes to those trained to see it. Allysen’s aura practically formed a grayish silhouette about her body, as if her body smoldered after being scorched often. “The game, the hunt…it isn’t what it’s used to be. I may have to–go back to get some better training.” The rogue had been twirling her testing box in her hands absentmindedly before she realized what she was doing and put the box back in her satchel. Allysen’s attention didn’t waver. “Go on,” she said. The bar noises overtook us again as we sat without talking before Allysen opened up the bag I gave her and put down three platinum coins. “Here,” she said. “Thanks,” I said, gathering up the coin and standing up. “Good luck out there. Shoot me a Orienmail if you need something,” Allysen said with two fingers from her forehead in salute. I bowed and left the bar. I wondered if the sensei wanted me to teach more to Allysen than the rogue would be able to teach me. There are times I don’t understand our ways. But then, as Allysen hinted, a rogue does things her way, and it’s not the same for every rogue. Perhaps I may have to do things differently. Use swords sometime, like Teacher Ryncletica. Or consider a quarterstaff. I can still show charity, but I would do so through subterfuge, rather than brute force. I can tell that Ryncletica’s Dark School may be more useful to me, at least to training level 6. If I can find that path that joins the monastic and rogueish craft, I might find my answers. With the oncoming Enhancement Pass looming closer, I wonder just how well a multi-classed character would fare. Rogue and Monk are my two favorite classes. I don’t much care for traps, but locks are always something I like to mess with. A shame that open lock isn’t a cross class skill that’s available to everyone. I’m quite certain that my monks would take it. At least my Ninja Spies. But rogues and their higher skill point count make things so much easier. I wish my monks got as many, as I’m quite the skill hoarding type. I like my movement skills. Hide, move silently, balance, tumble, swim, etc… I just can’t really find where to to pull that much intel to qualify for all of those skills. I suppose, when the enhancement pass comes along, I could pull off dex based, eschewing some strength for the numbers. In any case, I’ve missed reading these. My favorite so far was when Ryncletica was going through her rounds as a Ninja Spy (linked below). It’s nice to think of our characters as people living within a world, as opposed to just being something we’re playing around with. They form alliances and the like that just don’t get as much screen-time, I suppose. Imagine the perks a stealth player would get through ties with Phiarlan? It’d be nice to have other perks associated with the houses, as opposed to the current favor rewards. I love how the Carnival has a different set of speech options when you have a set amount of favor with them. Agreed. I’m an older player, so I try to enjoy the immersive detail of dialogue you find in some places. Play a Rogue and you discover that your guild ship’s barkeep was the guy who wrote up the trapmaking guide. As you noted, have a high enough skill in…something…and you’ll know that House P is full of spies. I’m glad you appreciate the storytelling modes. I’d almost forgotten that introduction to Ryncletica and how she started her Batman-like moves into shadow. She was really gimpy then because I didn’t know how to play her as well as I’ve learned up to now. I think that, if I didn’t play any of my characters with the modest level of role-play to “be’ them while in-game, I’d have stopped playing a long time ago. Thankfully I’ve found new builds that literally characterize them, and thus how I play them. Syncletica is a teacher now (my first toon), Lynncletica is the toughest, Ryncletica is a stealth master, and Quintessica goes Avatar on everything with all Grandmasters. It keeps me interested, yeah. And the new enhancement format (although not necessarily what’s there now) certainly will add to more personalization. 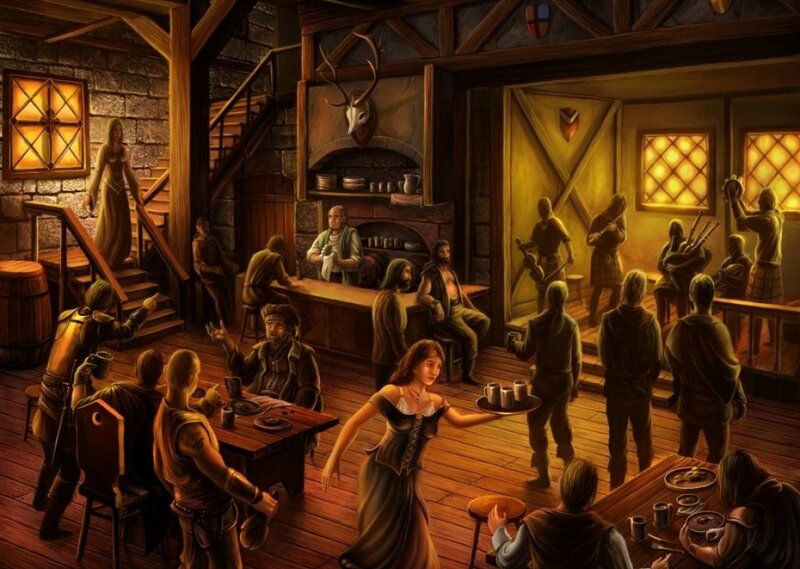 I like your idea with House P. It would be cool to have special favor not just from completing the quests on high difficulty, but proving to them (as in “Partycrashers”) that you prefer the subtle approach, such as obtaining an item only possible through Diplomacy, Bluff, or stealth. Would be nice to get a spy-related item from them, a special weapon from House D, et al. When I want Whirlwind, I’ll add 12 to INT and find a tome to get it to what I need for Combat Expertise and then Whirlwind Attack. Lots of Dodge bonuses, and a couple more skill points. 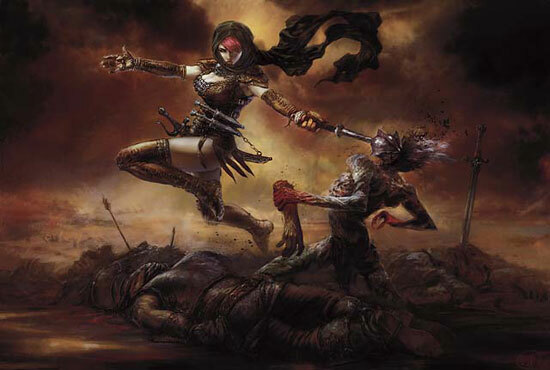 That introduction of her’s was what originally got me to roll my first Ninja Spy. Human, Dragonmarked (Passage). Felt very ninja-like with the disappearing into thin air, fast movement, etc… Not to mention, Dimension Door on a monk makes a lot of quests so much faster. Helped when I got lost, or when I was running The Pit. Some Dragonmark Love is part of why I’m looking forward to the Enhancement Pass so much. Just a shame that Spring Attack isn’t another Martial Arts Feat. Oh well, at least I’ll only have to take one feat for the marks, now. If I could manage it, I’d put full ranks into… Spot, and all movement oriented skills (Jump, Hide, Swim, Balance, etc…). For a monk to get that, would require 14-16 INT (depending on race). For something like that to be playable, would require a Finesse build, which would allow for some sacrifice out of STR for INT, and possibly at least one life under the belt. On my monks? I wish. My Rogues tend to go skill crazy, simply because it’s cheaper to afford. I once had a Rogue Thief-Acrobat that eschewed trap skills for mobility and locks. “If I can’t hop over it, or run through it safely, then I’m no Acrobat.” Balance, Bluff, Haggle, Hide, Jump, Move Silently, Open Lock, Spot, Swim and Tumble, if I’m not mistaken. She wasn’t very popular in many groups, though, what with no Search or Disable Device. I did a lot of stone carrying. Made her interesting to play, though. Uncanny Dodge got a fair bit of use. Got better at trap timing too, so always a plus. I think a few people could do some good if they tried something a little weird now and then. Like my Rogue without trap skills. A monk with an attention disorder. A fighter with some crazy attachment to a low level weapon because they had a crush on the NPC that gave it to them. That’s part of why a lot of people liked the table top, the characters had some personality. Being quirky was practically encouraged. I made a halfling with 20 stacks of holiday coal and just trolled the swizzle off anything I could, unfortunately I ran out just around level 8. Did you know that coal bypasses all dr? The DEX build is coming back. Just keep repeating that to yourself as you await the new enhancments. It certainly seems that way. And to make it that much better, some builds won’t need Weapon Finesse anymore, either! Sure seems that way in the Ninja Spy tree, effectively. No reason not to have more DEX for AC and better Reflexes, but I look at it’s use as to defense, not damage as from those old Rockan Robin builds. Once you can get a reflex save of 55, you dodge bullets, basically. Ryncletica, by the end of her first life, had 25% Dodge, 20% Concealment and 25% Incorporeality in Shadow Fade/Form with a reflex of around 45. That was a 55% effective miss chance that worked because of a higher DEX. My tanker has even better reflexes at 50-53 with 16/20/10 and hardly suffers damage except at EE–but STR is her forte and that’s the way that Monks should still lean to for more damage. That Weapon Finesse trap is still about and I hope it’s not an auto-granted thing. As I stated in the Henshin post, I wonder if this means the original Rockan Robin will now be the mainstay for Ninja Spies. About 16 dex, +N tome for TWF qualification (and perhaps some desire that stances will become free for all, but still require a certain ability scores for higher tier stances / elemental strikes), and all level ups into wisdom. You lose the Tier Three wisdom enhancement from live and the +2 wisdom capstone. That’s a good 1-2 DC. However, with all the new epic level items now, it may not really be that much of a problem. How did you manage 25% dodge? Very easy to maximize Dodge when you (must) take Dodge for Ninja Spy I, but I also add Mobility and Spring Attack (I add Whirlwind Attack if the build warrants), and then use Grandmaster of Oceans. Was likely around 21% at Level 20 but easily reach 25% by Epic 1 or 2. Now I happily have my cake and eat it too. No longer shall I be shackled to Treasons and Envenomed blades, lo I cry FREEEEEDOM. No one ever Lols at my mildly witty antics.